CFP Fishtail Polisher must process swell to have smooth transition between staves and make a uniform surface finish. The CFP Cover Fishtail Polisher is equiped with a 90 degrees rotable conveyor frame to place the swell under the end-sanding belt. When the sanding cycle is complete on the first end of the swell, the operator acknowledge the finish. Then, the conveyor rotates 180 degrees to sand the other end of the swell. 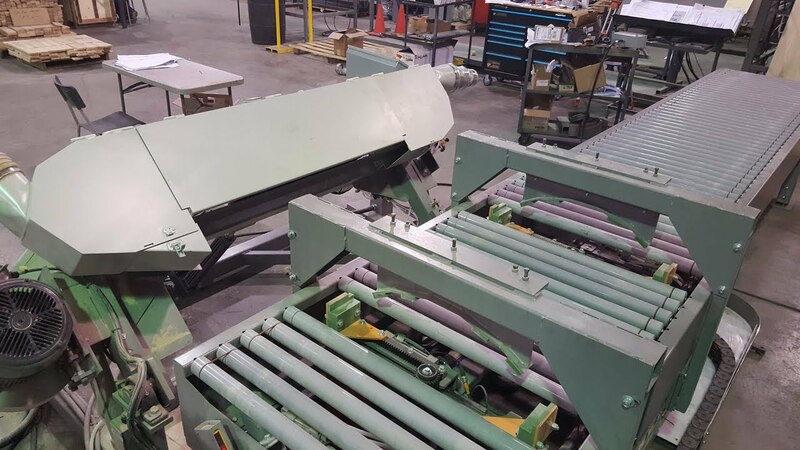 When operator acknowledges the sanding on the second end, the roller conveyor waits for unloading and loading the next swell by the operator. Operator supervises the movement of pad and can stop the sequence at any time for a manual repositioning of the sanding pad. In manual mode, operator controls manually the movement of the sanding pad and the rotation movement of the belt by means of a joystick. Operator completes sanding operation to both end of the swell and then requests for the next piece. A light fixture and a camera linked to a 24" monitor to show sanding surface to the operator for validation, position of camera to be determined on order. Profiled sanding pad carriage powered along the belt axis by a pneumatic cylinder with a wide pad. Estimated stroke length of 6"
Pneumatic belt tensioner with linear guides, adjustable pressure by air regulator. Two dust outlet collectors, 6" diameter, located on the head pulley end of the belt.